Has anyone on here ever bought Moffat plan through Gladfish? If yes how was the experience? I believe Gladfish is a re-brand of YPC. It was dormant until it was reactivated in April this year. It is run by the same individual - Brett Alegre Wood. See our thread on here. 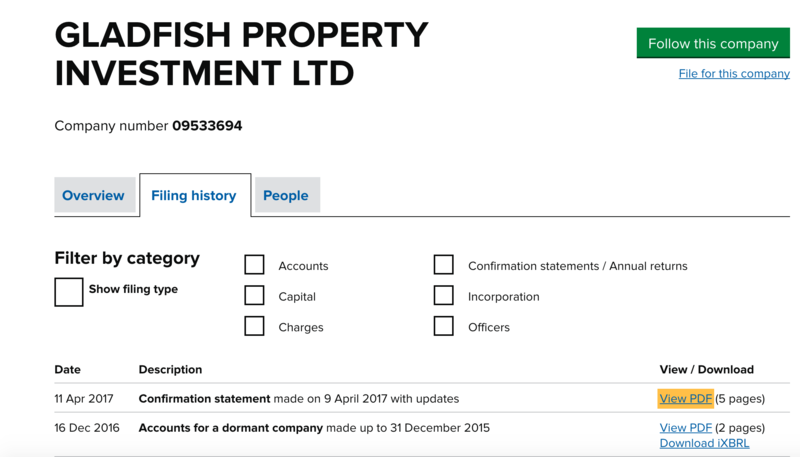 The accounts of YPC Group do not look too healthy showing net assets of over -£800K. It has been re-branded 3 times. So this is the fourth incarnation of the service offered by Mr. Algere Wood and you have to wonder at the timing of moving his activities across to another company. Hope that helps with your decision as to whether to get involved or not. Thank you for the very quick response and for the information. It has certainly made me think very hard about going with them now. They are actually two separate companies, both are still operational and as you will see we have very few complaints about either company. In fact considering we have been in existence since December 2004. I work very hard to keep all clients very happy but its unfortunate that a small few clients choose to come on here but there are now 1000s that are very happy. Things happen, developers don't perform, finance changes and 1000 other reasons why things go wrong and we deal with them, we always have. You don't survive the recession, last for over 10 years unless you look after clients.That's what we have always done. The accounts show my director's loan account which is a perfectly normal thing to have as a director in a company. It is a private business fully owned by me and therefore I have no reason to produce accounts that will impress shareholders. The rebrand if you look is changing the name from my personal name (before I got married to Arlene Alegre) to YourPropertyClub in May 2005 when we went with this brand, doing much the same thing as PropertyTribes was setup to do. Initially we were not selling property, it was only in 2005 that we begun selling UK property. We then moved to YPC (because that's what everyone called us) and property clubs name (not that we have ever been one) were not longer in favour and we were associated by name (NOT actions). We were initially setup to warn people against clubs and the tricks they played, (thats were not insiders tips and tricks newsletter came from) that was the whole idea of Your Property Club as in YOUR property club is doing this and that, that was were we came from and I have been very focused on helping clients ever since. Saying this is the 4th incarnation is totally misleading. We operated for over 10 years as YourPropertyClub then we shortened it. And it still goes today. I have a number of other companies that I run so saying this is misleading and defamatory. YPC Group still exists and early 2018 we are launching the new website with our bots and educational material. It won't be selling property. I hope this helps to clarify as I do not want people getting the wrong impression from these defamatory remarks. I had purchased with YPC who have now rebranded as Gladfish and I wouldn't touch them with a barge pole, they take your money and then pull out of the deal, only then to refuse you your money altogether. I took them to court after a year of begging for my money back as they refused and I finally got my money back. Thanks very much for the feedback. I think I will steer clear of these guys. We have used Gladfish to purchase something called an Opinion to Buy for a development in Manchester. Has anyone else purchased one of these? We would dearly love to talk to them as the situation with their current status is very worrying. Jane, have you been in contact with Caroline who is dealing with this development. Also you purchased through YPC Group not Gladfish. YPC will be dealing with this development. Caroline is keeping everyone up to date on this development. So just email her and she will be able to help out. I believe it is only 4 plots which the developer has sold on, but you still have the agreement registered. We are currently waiting to hear back from solicitors on this. Vanessa, Yes, it's an Option Agreement. Do you mean "option to buy" Jane?! We have had a issue with YPC where we did not get our reservation fee and deposit back. Please can you suggest a name of Solicitor. I would be grateful for your help.